Weaker films by previously great directors have taught me not to blindly collect a filmmaker's work. Like every Cronenberg film used to be a must-have until he started filming lesser writers work rather than his own. After Ghosts of Mars, I realized it was time to start getting selective with John Carpenter's work. There's only a handful of the truly great masters I can really get excited about every single one of their films - Bergman or Rohmer come to mind. And even then it's not all perfect tens. But as rocky as Woody Allen's road is known to be, and how frequently his work is popularly rejected, I'm always eager for the new Woody Allen movie. Every one is at least worth owning and revisiting for me. Yes, even Hollywood Ending, Whatever Works or whatever you consider to be the bottom of his barrel. I'm excited for it; the latest Woody Allen movie is here! In Irrational Man, Joaquin Phoenix is a hot shot philosophy professor who rolls into a stodgy college campus. He's having too much of an existential crisis to appreciate all the attention he's getting from his student Emma Stone and married faculty member Parker Posey, but he believes he may have finally found his calling when he overhears a conversation at a diner. A woman laments that a corrupt judge is ruining the lives of her and her family, and it occurs to Phoenix that perhaps he's finally found his calling in life: to kill this judge, and in doing so make the world a better place. It's a moral puzzle as well as an intellectual one, for an amateur to plot a perfect murder. Look, Woody's not one to hide his influences. Throughout the film characters directly reference and debate Kierkegaard, Jean-Paul Satre, Dostoevsky, Immanuel Kant, Hannah Arendt... their ideas are sometimes even stated outright and then challenged by the decisions these characters make in the story. The humor's very subtle, playing more like a drama with am underlying sense of satire. Tonally, it's closest to Allen's Match Point or Cassandra's Dream. The cast is great, the film's beautifully smart, but there's a(n intentional?) distance between you and the characters. You're observing and studying more than relating and getting caught up personally with them. Not that there's anything necessarily wrong with that, but at the end of the day, I consider it to be a lesser though still very good Allen film. The issues didn't grip me, but I had a good time with it, the cast was excellent, and it leaves you with a lot to go back to. 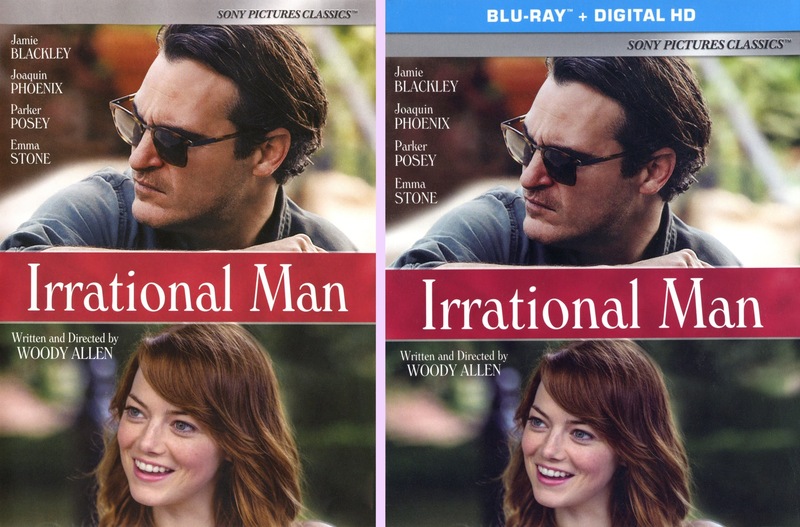 Irrational Man came out at the beginning of 2016 as separate DVD and blu-ray versions as a new release. There's not a lot of surprises to be revealed in comparing the DVD and blu-ray discs, but I own the blu and have access to a copy of the DVD, so I might as well be extra thorough. And it's not like Sony has an exactly perfect 100% success ratio with their new releases ("cough, 2015 black crush, cough"), so we should look to be sure. Sony 2016 DVD top; Sony 2016 blu-ray bottom. Again, it's a new release film, so nothing should really be going wrong here. Then again, Allen's still shooting on 35mm, so it's not like the filmmakers are just emailing a finished master to the label for them to copy to theaters and blu-ray. It's an attractive looking film, thankfully showcased by a first class release. Framing is 2.40:1, the colors and brightness look natural, etc. The DVD and blu share the same master, though obviously the former is a bit softer and more heavily compressed. Lines are clearer and smoother on the HD blu. Both discs feature 5.1 mixes, though of course only the blu's is lossless DTS-HD. Both also offer French and Spanish dubs, plus English, English HoH, French and Spanish subtitles. The extras are also optionally subtitled, which is nice. Sure, there ain't much by way of extras, but after decades of having it pounded into our heads that Woody Allen films shall never have extras besides the trailer, I'm happy for what little we do get. Ever since Midnight In Paris, the trend has been to at least include short promo featurettes on each of his films, and that's what we get here, too. On the Red Carpet: Los Angeles Film Premiere, cuts together interviews with Emma Stone, Parker Posey and Michael Barker (co-president of Sony Pictures Classics). It's super short (4 minutes), but it isn't padded with any film clips, so at least it's all content. Besides that, there's just the trailer and a slipcover. The trend with Woody Allen blu-rays these days seems to be to start out really expensive, and then the price slowly sinks until they're dirt cheap. Irrational Man started out at almost $40, and that's not just the MSRP, but what all the sites were actually selling it for. Considering this is a single disc with barely any extras, no booklet or anything kind of release, that's pretty bold. But in the four months since its release, it's already come down to a reasonable under $20 price. So I'd recommend it starting now. It's no special edition, but it's a first class "plain" release. Or you could keep holding out, and it'll probably get cheaper. he he But do cop it at some point; it's a good film.